New Melones Lake is currently holding 532,256 acre-feet of water. The lake level came up one foot this past week and should continue to rise with the recent and upcoming rainfall. It is currently at 864 ft. above sea level and 221 ft. from full. The water clarity is clear in most of the lake with a slight stain in some areas. The water temperature is cooling, with the average being 56-60 degrees. The concrete ramp is CLOSED and should re-open (possibly this week) once the lake reaches 865 ft. There is also a courtesy dock on the dirt launch which will be in place until the concrete ramp is open again. 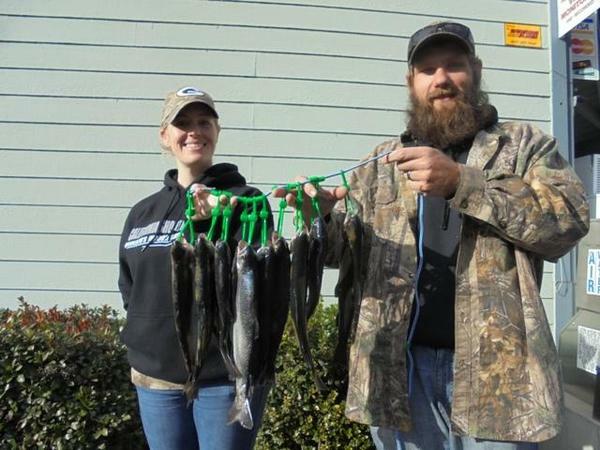 Dennis and Katy Coyle of Ceres caught two limits of rainbow trout while trolling and casting spoons up above the 49-bridge. 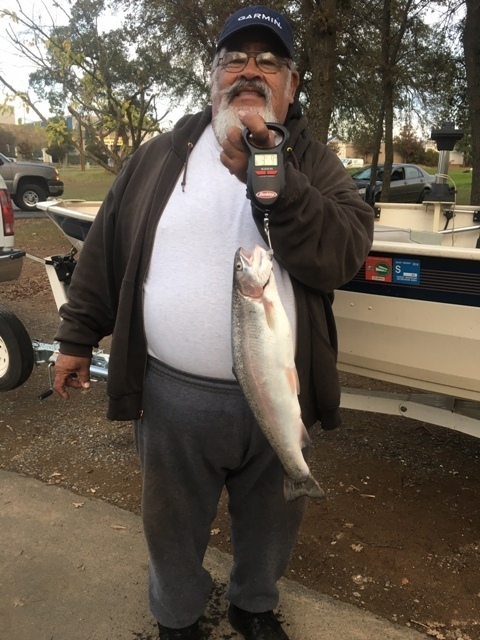 Brian Goldsmith of Stockton caught a limit of rainbow trout which included a hefty 3-pound, 4-ounce fish. He was top-lining a Krocodile in a major creek arm. The trout are starting to bite and we are seeing and hearing of multiple limits being caught. The water temperature continues to drop each week and the lake is showing signs of turning over. The cool water will rise toward the surface and all the trout that have been holding in deep water will follow. In some areas of the lake, trout can be found feeding on the surface. Trolling anglers throughout the summer have been catching fish down to 100'. Most of those fish have started to move up in the water column and can be found in the 20' to 40' range. Some fish have come even closer to the surface and can be caught in 20' or less. For trolling in deep water try using a spoon that has an erratic action and will disperse water. Excel and Hot Ticket Spoons have an exaggerated bend and will produce ample action. The Hot Ticket Spoons come in some real shad and rainbow trout patterns. For targeting fish that are close to the surface, try using spoon or an F9 or F11 Rapala. On clear days try natural shad or trout patterns and switch to bright colors or gold on cloudy/rainy days. Bank anglers have been catching a few planted fish and a few holdovers. It will continue to get better as the water cools. Try using a crawler/mallow combo or Powerbait fished on a standard bait rig. Light line and light hooks will help coax some of the finicky fish into biting. Garlic scent can be added to further attract fish. Glory Hole Sports Big Fish of the Week goes to Dante Ivani. He caught a beautiful 4-pound, 2-ounce rainbow trout in deep water on a crawler. The bass are slowly transitioning into a winter bite. The water temperature continues to cool which will slow down their metabolism making them less likely to chase fast moving baits. Many fish will follow the shad into the backs of the major creek channels. Look for the bait and the bass will be nearby. The best way to find fish is to use a presentation that will productively cover water without moving too fast. Ripbaits can be fished with a rip-pause action and left hanging in the strike zone. Small swimbaits can be fished at various speeds and used to target different depths and locations. Once you find a productive area try slowing down and fishing a jigging spoon or a dropshot rig. A vertical presentation works well during the cold winter months. The bait can be lowered to the depth that the fish are holding and left there until the fish strikes. Bass are opportunistic feeders and will bite baits that appear to be wounded our less likely to swim away. Many bottom bouncing presentations will also work. A football head jig is a go-to lure selection during the colder months. Use variations of brown, green pumpkin and purple. A shakeyhead or darthead worm fished at various depths will also catch fish. Some anglers are tossing large swimbaits to catch some giant bass. It is a tough bite to chase and you may only get a bite or two all day. PLEASE PRACTICE CATCH AND RELEASE. Take photos and carefully release the fish back into to the lake to maintain a healthy fish population for generations to come. 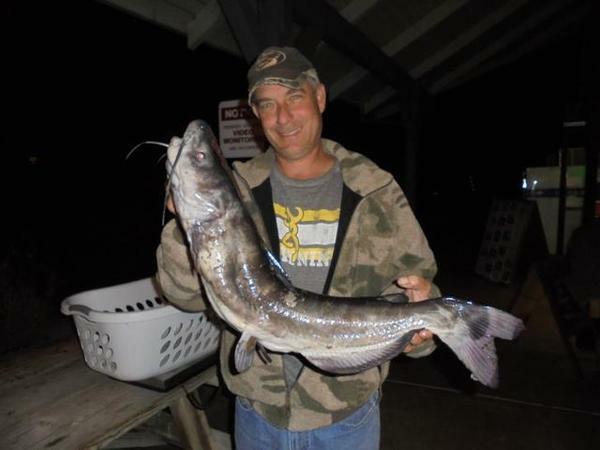 The Glory Hole Sports Fall Catfish Contest has come to an end. The catfish bite proved to be tough and very few fish were caught and brought to the scales. Generallymany big catfish are caught during the fall months as the catfish will feed heavily to bulk up for the cold winter months to come. Most of the fish have been caught using chicken livers. Also, frozen shad and mackerel will work. Add scent to your bait and try fishing different depths and locations.